This tiny, well-camouflaged clingfish provides a classic example of commensalism. The clingfish gains protection by hiding on its host — a crinoid — while the host is unaffected. Have you ever seen a fish remain almost perfectly motionless as it is swarmed over and “picked at” by another type of fish? Or have you ever seen a fish look like it was “yawning,” only to look more closely and see a small shrimp or fish such as a goby swim unharmed right out of its open mouth? As much as scenes like these might catch you by surprise the first time you see them, they are rather commonplace in reefs all over the world. These behaviors are part of a symbiotic relationship known as cleaning. In cleaning the host gets rid of parasites, dead tissue, bacteria and fungi, while the cleaners get a meal, and neither animal is harmed. The term symbiosis (“living together”) describes a number of relationships between members of two different species of animals. In laymen’s terms, symbiosis is often used to describe only mutually beneficial relationships such as cleaning. But in scientific circles, the term symbiosis describes a whole range of relationships, from mutually beneficial ones to parasitism, a relationship in which one organism feeds on the living tissue of a member of a different species. Hardly what one would classify as mutually beneficial! In all symbiotic relationships there is a host and a symbiont. In the example of a moray eel being cleaned by shrimp, the eel is usually classified as the host and the shrimp as the symbiont, but some scientists refer to all parties as symbionts. In this second of two articles about marine animal behavior, we’ll continue to examine a number of relationships you can observe during many of your dives. Having a basic understanding of these animal behaviors will help you get the most out of your diving by providing you with keen insight into the inner workings of underwater communities. Cleaning is probably the best-known example of a mutually beneficial relationship in the marine environment. This type of relationship, in which both parties benefit and neither is harmed, is referred to as mutualism. On almost every reef I have ever dived, I’ve seen some type of cleaning behavior taking place. Cleaning often occurs at the same place day after day. The physical location where the cleaning occurs is known as a cleaning station. 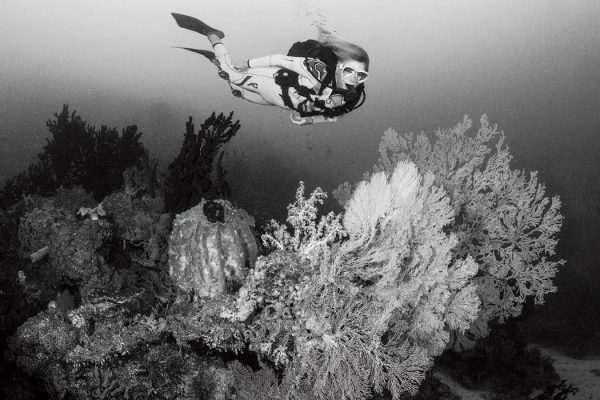 Perhaps the best way to find your first cleaning station is to have an experienced dive guide point one out to you. Once you see one, you will begin to locate them easily on your own. Often at cleaning stations you will see animals like big groupers or moray eels display by opening their mouths as wide as they possibly can and then remaining as still as they possibly can. Other hosts, such as creolefish in the Caribbean and blacksmith fish in California waters, signal a request for cleaning by swimming near the cleaners and hanging almost motionless while upside down in the water column. These displays are not tricks. The hosts need to be cleaned to rid themselves of parasites and prevent infections. Often the hosts “blanch” their skin to make darker-hued parasites stand out so they are easier for the cleaners to find. During intense cleaning, Nassau groupers, a very common fish in many reef communities, will change their skin pattern, causing their alternating brown and white stripes to disappear in order to create a consistent coloration so that parasites will stand out in contrast. At an active cleaning station, you’ll often see a variety of smaller animals, including fish such as gobies, wrasse and juvenile hogfish, and many species of shrimps, actually enter the mouths of the grouper, eels and other potential predators in order to clean them. Hosts such as groupers do not harm the cleaners, and when the hosts have had enough, they will usually signal by partially closing their mouth two or three times in rapid succession. Or they might shake their bodies rapidly with a series of quick tremors. The cleaners know it’s time to exit, and they await the next host. Unfortunately, the idea of a perfect relationship is almost too good to be true. In South Pacific waters, there is definitely a fly in the ointment. There is a mimic cleaner known as a saber-tooth blenny. This opportunist looks almost identical to the common cleaner wrasse that inhabits many reefs, and the blenny also mirrors the cleaner wrasse’s antics — so well, in fact, that it often tricks unsuspecting hosts. The saber-tooth blenny advertises its presence or swims into an active cleaning station. The host displays a request for cleaning, and the saber-tooth blenny quickly takes a bite out of the unsuspecting host’s skin and darts away before it gets caught. It’s a dangerous game for the blenny, but a great opportunity for the observant diver to witness the nuances of nature at work. Another less obvious but excellent example of mutualism involves the relationship between host coral polyps and the symbiont algae zooxanthellae (zo-zan-thell-ee) that resides within the coral’s tissue. The relationship between this algae and the corals it inhabits proved to be the solution to one of the great scientific mysteries of the 20th century. Zooxanthellae are microscopic, single-celled algae that are the foundation of all food chains in tropical reef communities. If you’ve never heard of them, don’t be surprised. Few nonscientists are aware of their existence. But don’t underestimate their value or the importance of the relationship between the algae and the corals in all tropical food chains. All major food chains are built on a foundation of plants, not animals. Through the process of photosynthesis, plants convert the sun’s energy into simple sugars and other nutrients. Thus, plants are said to be the primary producers, and all animals depend on plants either directly or indirectly for their food. For years, marine scientists were puzzled by the apparent absence of plants in tropical reef communities. In other words, scientists couldn’t figure out why tropical reef communities didn’t collapse due to the lack of a plant foundation. In terms of biomass, it appeared that there were far more consumers than producers in the food chains of tropical seas. Shortly after World War II scientists discovered the existence of zooxanthellae, algae that live in sand, on dead corals, and inside the polyp tissues and skeletons of living coral. The algae are so numerous that in some cases they provide 80 percent of the coral’s total weight. With this discovery scientists had finally shown that food chains in tropical reef communities operate under the same fundamental laws that govern all other food chains. The algae supply the corals with oxygen and nutrients as by-products of photosynthesis, enabling the corals to live, reproduce and build their skeletons. The algae benefit by gaining a safe place to live and having access to raw materials such as carbon dioxide and inorganic nitrogen, both of which are necessary for photosynthesis. These raw materials are given off by the metabolic processes of corals. By taking calcium ions from the water and transforming them into calcium carbonate, the algae also help the corals produce their limestone (calcium carbonate)-based skeletons. It is clear that the relationship between zooxanthellae and corals is mutually beneficial, and therefore is classified as mutualism. In another common type of relationship known as commensalism, one member of the relationship benefits while the other member is not harmed, nor does it necessarily benefit. Some classic examples of commensalism include the tiny, well-camouflaged clingfish that often attach to crinoids and gorgonians. The clingfish gain protection by being able to hide in or on their host, while the host is unaffected. Without a little help, clingfish can be really difficult to find, but once again, find your first one and it gets easier and easier to locate more. Clingfish are typically 1 to 2 inches/3 to 5 cm long, and their coloration almost perfectly matches that of their host. Clingfish attach to their host via their modified pelvic fins, and they are typically very still. As a result, they are difficult to find. Shrimp, commonly called abalone shrimp, that live on abalone in West Coast waters and the small fish known as man-of-war fishes that live amongst the tentacles of the Portuguese man-of-war provide other examples of commensalism. In the case of man-of-war fish, they receive protection due to the wall of defense provided by the potent stinging tentacles of the Portuguese man-of-war. The man-of-war does not benefit from the presence of the small fish, except when the fish err and blunder into the tentacles. The mistake is often fatal, and the fish end up being a meal for the Portuguese man-of-war, a hydroid commonly mistaken as a type of jellyfish. Many jellyfish have similar relationships with smaller fishes. Leatherbass and some other juvenile fish live amongst the protective spines of sea urchins in a similar commensal relationship. The fish gain protection by virtue of the urchin’s spines, but the urchin doesn’t seem to benefit. If you look closely at a jellyfish, you may see small crabs riding on the bell. Their relationship is similar to that of remoras, or suckerfish, that are so often seen attached to turtles, groupers, sharks, manta rays and other larger hosts, such as whale and other sharks, dolphins and barracuda. While the remoras benefit from the relationship by picking up scraps after the host has captured a meal, a primary benefit to the symbiont remora is the free ride from meal to meal or feeding ground to feeding ground around the ocean. The same is true with the crabs that hitch a ride on jellyfish. When travel is involved, the relationship is described as phoresis. It is only right to mention that while remoras do benefit from transportation and access to scraps provided by hitching a ride aboard a shark, it is not at all uncommon for sharks to eat remoras. So even in the sea, there is no such thing as a free lunch. In some instances it is believed that remoras rid hosts of parasites on their skin, but the relationship between remoras and hosts is far from being completely understood. Another classic example of phoresis is the relationship between the California gray whale and the gray whale barnacle. This barnacle is only known to occur on gray whales, and the whales carry them to nutrient-rich waters. Another type of symbiotic relationship is that of parasitism. Parasites feed upon the tissue of their hosts. As is the case on land, marine parasites are common. Many parasitic worms, for example, live inside their host’s body and are known as endoparasites. Their existence is one of the primary reasons we are well-advised to closely examine raw fish in sushi before we eat it. Some of those worms will get along just fine while living inside humans, but the parasites can be mighty rough on us. On Caribbean reefs it is quite common to see a number of external parasites attached to the skin and external tissue of their hosts. These parasites are called ectoparasites. Perhaps the most common example in Caribbean waters is that of parasitic isopods on the heads or faces of blackbar soldierfish. Another example often seen on Southern California shark dives is that of parasitic copepod eggs trailing from mako sharks’ fins. Sometimes the copepods can be seen on the sharks’ faces and mouths as well. While difficult to see with the naked eye during a dive, it is ectoparasites that cleaner fish and shrimp are removing from the skin of their hosts at cleaning stations. In many cases the parasites are small crabs or other crustaceans, and if you do get a good look, you can often see the parasites scurrying about on the skin of the hosts. Some small anemones known as zoanthids (zo-an-thids) are thought to be parasitic and to overtake the exposed surfaces of sponges and gorgonian corals. It is not uncommon to see tropical sponges or gorgonians in temperate seas encrusted with anemones. However, recent studies have altered this classification in some instances. While zoanthids do deprive their host of some feeding surface area, they also help provide vital protection against predators. Certainly this is the case with a variety of Caribbean sponges and sponge-eating fishes such as angelfishes and filefishes. Studies have shown that these potential predators avoid feeding on sponges that serve as hosts for zoanthids. Whether it is the foul taste, the potent sting or a combination of the two that repels sponge-eating fishes remains unknown. Most of us have a strong desire to look at any relationship in the animal kingdom, and quickly classify it and file it away in its proper place. While this might make life nice and orderly, it isn’t very realistic. In fact, there are lots of relationships, even ones that are quite commonly observed, that aren’t well-understood. The relationship between anemonefishes and anemones are classic examples. For many years it was commonly believed that the relationship between anemonefishes and sea anemones was one of mutualism. It was believed that the anemonefish gained protection against possible predators from the stinging tentacles of the anemone and that the anemonefish occasionally brought the anemone food. Another explanation was that the anemonefish benefited by being protected and the anemone gained, not through “gifts” of fish, but instead from nutrients received via the defecation of the fish. Still another explanation was that the anemonefishes benefit but the anemones do not. Studies have concluded that there is an element of truth in all of these theories and in others as well. The relationship between anemonefishes and anemones occurs only in Indo-Pacific waters, meaning of the approximately 1,000 species of anemones found worldwide, only 10 are known to serve as hosts to anemonefishes. There are 28 species of anemonefishes, and all of them share a relationship with one or some, but not all anemones. In the wild, anemonefish have never been seen bringing food to anemones, but the behavior has been reported on numerous occasions with captive animals. In the wild, when scientists remove anemonefish from the protection of anemones, sooner or later the fish end up as a predator’s lunch. Interestingly, in some cases removing the anemonefish seems to have no observable impact on the anemone, but in other cases a variety of anemone-eating fishes are quick to prey upon the anemone. In those cases, it appears that the anemonefish provides some protection for the anemone. At least in the case of anemonefish and sea anemones, it is dangerous to generalize about the relationship between the species involved. In truth, there is no singular relationship, but a variety of species-specific interrelationships, and that explanation does not fit neatly into our preferred system of classification. But the fact that we can’t easily file the relationships away doesn’t make them any less enjoyable to observe, or any less important to their ecosystem. Another interrelationship that is not well-understood but is commonly observed exists between many species of sharks and communities of jacks that associate with the sharks. During many parts of the year, if you visit one of the popular Bahamas shark dives, you will see schools of jacks accompanying Caribbean reef sharks and blacktip sharks. In many instances the jacks are swimming in formation only inches from a shark’s mouth. Why? The predominant theory is that the jacks only have to be concerned with the whereabouts of a single predator, meaning that no other predator will swim up to a big shark to try to grab a jack. But even so, the jacks don’t have much room for error. Another explanation is that the jacks often rub against the rough skin of the sharks to rid themselves of parasites. But still other factors probably contribute to these scenarios and to similar situations where jacks accompany manta rays, dolphins, turtles, whitetip reef sharks, tiger sharks, lemon sharks and the mackerel that swim with silky sharks. Of course, these are just some examples of many relationships that are not yet completely understood. The question of why scalloped hammerheads school is one that continues to puzzle scientists. These sharks are commonly seen by sport divers in Mexico’s Sea of Cortez, at Costa Rica’s Cocos Island and at Ecuador’s Galapagos Islands. Scalloped hammerheads, one of eight species of hammerheads, are one of the few top-end marine predators that live in large schools. With very few natural predators of their own, it is difficult to understand what the hammerheads have to gain other than more immediate access to a mate. Clearly, it takes a lot more food to feed an entire school than it does to feed a single shark, and the members of the school are not thought to cooperate when feeding. In fact, it is generally accepted that the sharks tend to gather during the day, but swim as far as 14 miles/23 km away from the group at night to hunt alone. Exactly what benefit is gained from the long swims back to the group every day remains a baffling question, especially in a species that is not believed to mate on a daily basis. The relationships we do not understand well serve as wonderful examples of how much more we have to learn about the sea. They remind us of the importance of preserving the natural balance in ecosystems whose roles we don’t fully comprehend. Those relationships and behaviors that we do understand remind us how wonderful nature is, and how much there is to enjoy when we dive.